Yu-Gi-Oh Ancient Prophecy, Pokemon Platinum Holiday Tins, & AGoT Tales from the Red Keep Arriving Tomorrow! We expect all of these new releases to arrive tomorrow! 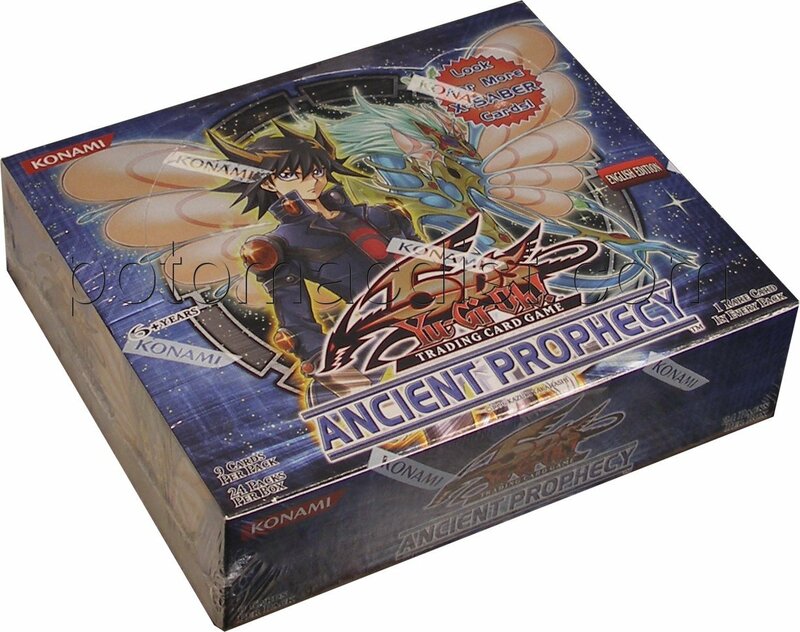 Yu-Gi-Oh Ancient Prophecy is one of our best sellers right now. Tomorrow is the official release date for this product, and we hope to ship all pre-orders out then. It's still not too late to order. Booster boxes are $60. Cases (12 boxes are $708. 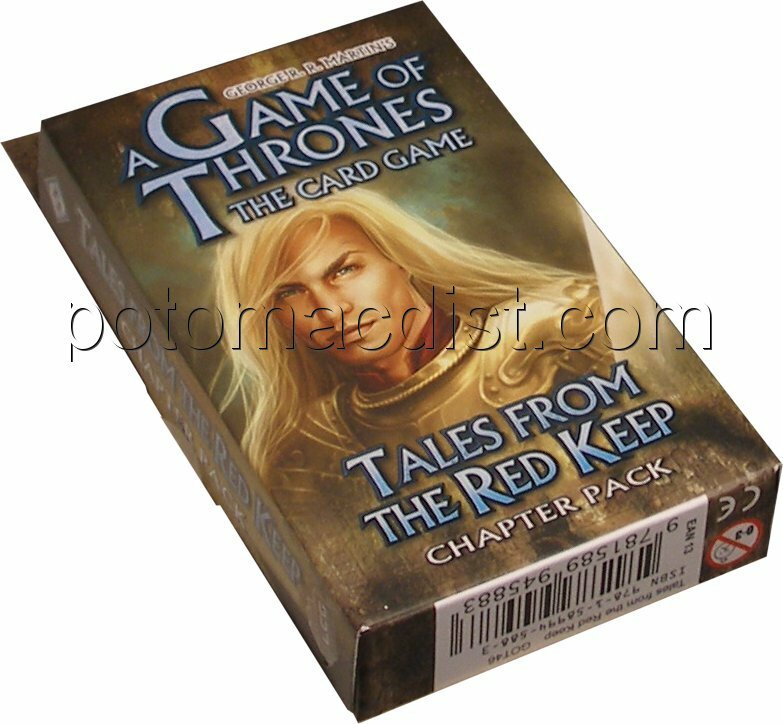 The A Game of Thrones Tales from the Red Keep Chapter Pack is the fourth release in the King's Landing expansion. Individual packs are $9. Purchase a 6-pack for just $44 ($7.33/pack). The 2009 Pokemon Platinum Holiday Tins are available for $109 per case. Each case includes 9 tins (3 different designs). Each tin includes 1 Diamond & Pearl series booster pack, 3 Platinum series booster packs, and 1 of 3 foil Pokemon LV.X promo cards (Charizard LV.X, Garchomp LV.X, or Rayquaza LV.X). New Pre-Order Items - Warlord 4th Edition News - Yu-Gi-Oh Ancient Prophecy Arrives Next Week! We have some good news for customers waiting on Warlord 4th Edition. From what we've been told, the 4th Edition products are now inside the U.S. We are hoping that they are shipped out to us by the end of next week, in which case we should have them by the middle of the following week. We've set a tentative date for their arrival here of September 9th. 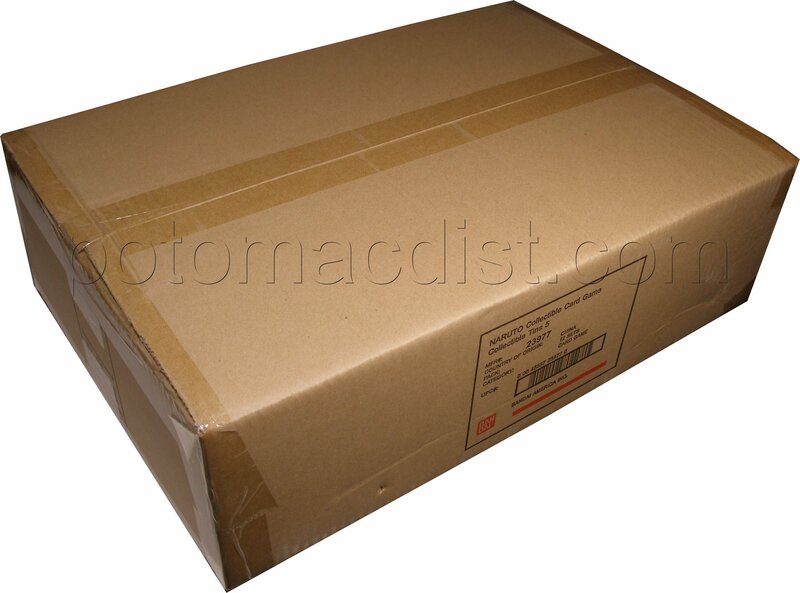 As always, we will ship them out to our customers the same day we receive them. The other good Warlord news is that there will be another 4th Edition product arriving with the Base Set, Crimson Coast, and Shattered Empires sets. The 4th Edition Treasure Chest Expansion is also expected soon and we are now accepting pre-orders for it. Each Treasure Chest set includes 40 of the most played cards from the 4th Edition game, including Judge Aeacus, Incenerate, Aegis, and Pyrothraxas, as well as 15 all-new indispensible additions to your deck - one character for each faction, plus one action card and one item for each class. Sets are available for $19 each. Yu-Gi-Oh Ancient Prophecy arrives next week. If you haven't placed a pre-order it isn't too late! We still have booster boxes and cases available. Almost all of Konami's Yu-Gi-Oh products have been selling out very quickly. The recently released Series 1 tins were sold out at the factory by the time they arrived in our warehouse. So don't hesitate if you are planning to place an order. Booster boxes are $60. Cases (12 boxes) are $708. Star Wars Clone Wars Widevision On Sale! Star Wars fans will be excited to know that we are now accepting pre-orders for Topps' Star Wars Clone Wars Widevision trading cards. The new set is scheduled to arrive the week of October 30th. Every box will include a hobby-exclusive sketch card! In addition to the 80 base cards in the set, there are 1/1 Gold Foil Parallels, Sequentially-Numbered Silver Foil-Stamped Parallels, Animation Clear Cels, Season 2 Sneak Previews, Flix Pix Motion cards, Foil cards, and Hobby-Exclusive Autograph cards! Boxes are on sale for $40 each. Cases (8 boxes) are available for $309. American Heritage Heroes Edition, Naruto Emerging Alliance Blisters, & Epic Time Wars Have Arrived! The new American Heritage Heroes Edition from Topps arrived today. Every box contains 2 Autographed, Cut Signature, Patch, Relic, or Stamp cards! This set is loaded with inserts and chase cards. Boxes are just $60. 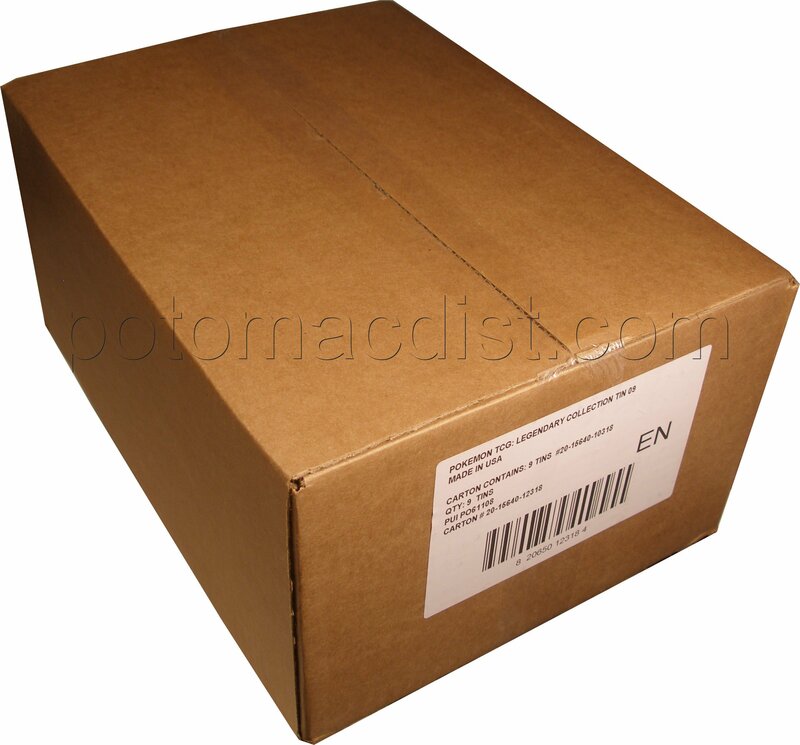 We also received a shipment of Naruto Emerging Alliance blister boxes today. Each blister box includes 15 1st Edition booster packs. Each pack includes 10 cards (1 holographic foil card, 1 rainbow-stamped rare, 2 uncommon, and 6 common cards). Bandai has already sold out of Emerging Alliance, so we don't expect these to last long. Boxes are $46 each. Cases (10 boxes) are $449. Also arriving today was the new Epic Time Wars expansion. We shipped all Time Wars pre-orders today. We have additional booster boxes in stock for $55 each. Path of the Destroyer, the new Celestial Edition expansion for the Legend of the Five Rings collectible card game, has arrived! We have shipped all pre-orders, and we have additional booster boxes and booster cases in stock and ready to ship today! Due to unforeseen demand, the manufacturer is now sold out of Path of the Destroyer starters. We are sold out as well but will be looking for more in the coming weeks. Please contact us at sales@potomacdist.com if you would like to be notified if and wehn we are able to find more starters. In other L5R news, we expect to have more Celestial Edition booster boxes in stock tomorrow! The boxes are available for order on our web site now for $78 each. We've been out of these for several weeks and expect this restock to sell very quickly. Order now and we will ship them to you tomorrow. We expect to have the new Epic trading card game expansion, Time Wars, in stock tomorrow. The new set introduces 150 new cards that allow players to pit dinosaurs and dragons against mechs, missiles, and machine guns. It's not too late to place your order. Booster boxes are just $55! The newest Highlander expansion, Endgame, has arrived! All pre-orders have been shipped. We have boosters available for $76 each and starters for $93 each. AEG's new Legend of the Five Rings expansion, Path of the Destroyer, will be released on Monday. We have a limited number of booster boxes still available to be shipped on Monday. Customers who don't order in time to be included with Monday's shipment will be shipped on Tuesday or Wednesday as our restocks arrive. Boosters are $100 per box. We are sold out of starters at the moment. Apparently the demand for starters far outweighed what AEG had expected. We are doing our best to find additional starter boxes. Email us at sales@potomacdist.com or click here and enter your email address to be notified when we have more available. It was a big week for new products. In addition to the Highlander Endgame, we also received Pokemon Supreme Victors boosters and starters which are selling as quickly as we can restock them. Boosters are $87 each. Starters are $64. Konami's 2009 Yu-Gi-Oh Series 1 Tins also released this week. Konami is already sold out of the new tins. We also sold out of our initial shipment quickly, but we have a small number of cases back in stock now. They are $189 per case. We expect these to sell out again very quickly. We've added several new pre-sale items to our gaming list this week. Konami will be releasing a new Yu-Gi-Oh Structure Deck in October. The Warriors' Strike Structure Decks include 40 cards (including 1 ultra rare and 2 super rares), a rulebook, a deluxe game mat, and a dueling guide with instructions on how to enhance the deck. The deck combines 3 themes - Warriors, Equip cards, and Gemini Monsters (first introduced in Tactical Evolution). Boxes are just $51. Upper Deck just announced plans to release a World of Warcraft Scourgewar Bundle in December. Each bundle includes 5 Scourgewar booster packs, 1 Scourgewar Playmat, 1 Scourgewar Deck Box, 1 Consumable Loot Card from Scourgewar, and 1 Scourgewar Collector's Poster. Each booster pack contains 19 cards. Scourgewar introduces new mounts, keywords, and a new master hero - Kel'Thuzad. Scourgewar Bundles can be pre-ordered for $25 each or $249 per case (12 bundles). We are also accepting pre-orders now for Upper Deck's World of Warcraft Miniatures Souls of Vengeance Deluxe Starters. Each deluxe starter includes 6 miniatures (3 each from the Alliance, Horde, or Monster factions). Each box also includes either 2 blind rare figures or 2 blind epic figures to match the faction of the revealed figures, as well as 6 character cards (1 for each mini), 12 ability cards (2 for each mini), 6 custom dice (2 of 3 varieties), 6 miniatures Ubases (2 of 3 varieties), 1 Deluxe Game Board (1 of 3 varieties), 1 rulebook, 1 WoW TCG sample pack, and tokens. Individual deluxe starters are $37. Cases (3 starters) are just $99. NECA produced this game back in 2005. With only one expansion - Christmastown, which was released in 2006 - the lifespan of the game was pretty short. That's probably why these boxes are so tough to find these days. The Nightmare Before Christmas property still has quite a following, so we won't be surprised if these disappear quickly. The third and final installment of Decipher's popular Reflections sets has generally been the toughest (and most expensive) to track down. It was released in November 2001 just before Decipher stopped producing the Star Wars CCG. Like the other sets produced late that year that are now very tough to find (Theed Palace and Coruscant), Reflections 3's print run was probably much smaller than what Decipher had made previously. Earlier this year we found some RIFTS boosters for the first time in nearly six years. When we sold out, we figured it might be six more years before we tracked down more. But as luck would have it, we've already managed to do that. This game was produced by Precendence Entertainment (the same company that brought us the Babylon 5, Wheel of Time, and Tomb Raider CCGs) back in 2001. Not long after RIFTS got off the ground, Precedence ceased to exist, so the base set was the only one ever produced. And while it is tough to find these boxes, they are still quite a deal at less than $1 per booster pack. We've also got RIFTS starter boxes for just $19! We were informed today that Upper Deck's upcoming World of Warcraft Miniatures expansion, Souls of Vengeance, has been delayed. We originally expected Souls of Vengeance to arrive by the end of August. We now expect to ship it by October 18th. We are still accepting pre-orders for booster cases ($179), half-cases ($94), and individual packs ($14). 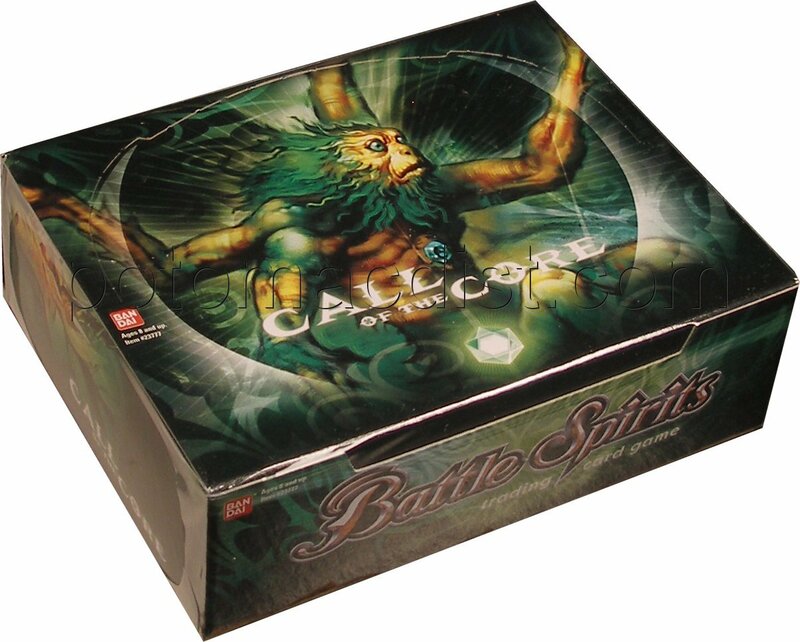 Bandai's new Battle Spirits: Call of the Core game was released today. 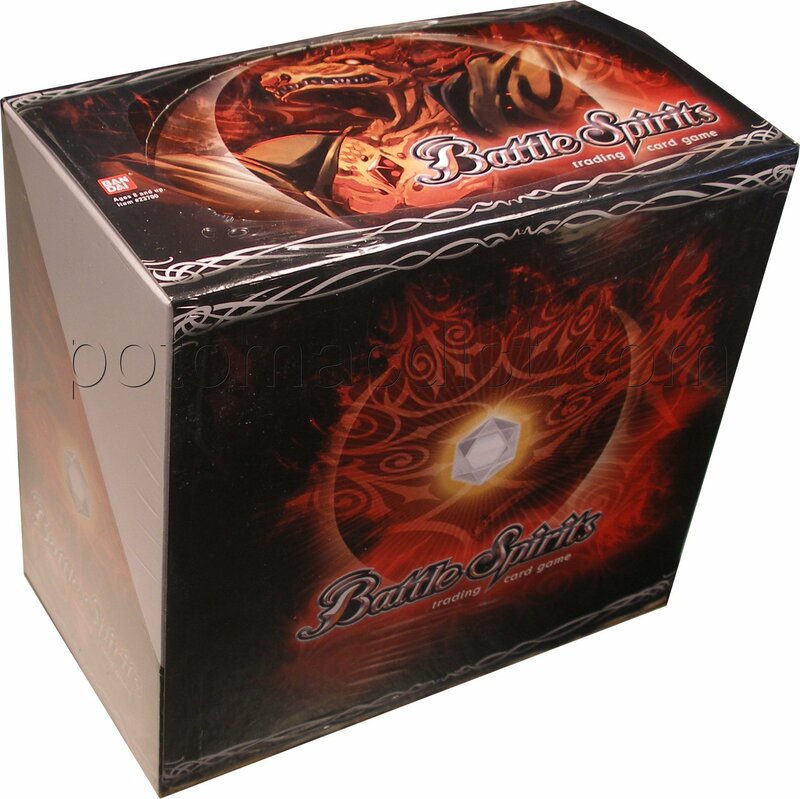 Battle Spirits is a fantasy game where players attempt to master the use of their core to summon spirits from different lands: Ruby red cores from the Land of War ruled by dragons, Amethyst purple cores from the Land of Undead ruled by zombies and evil snakes, Emerald green cores from the Land of Trees inhabited by seekers of the World Tree, and White diamond cores from the Land of Ice ruled by masters of machines. The game introduces unique core mechanics which create immediate conflicts right from the start of the game. Each booster pack includes 6 commons, 2 uncommons, and 1 of 3 rare types - Rare (3:4 packs), Master Rare (1:5 packs), X-Rare (1: 23 packs). There are two starter deck configurations (40-card Emerald/Ruby deck and 40-card Diamond/Amethyst deck). All cards are exclusive to starter decks and aren't found in boosters. Each deck includes a play mat and special core tokens. We have booster boxes available for $57 and starter boxes for $51. The new Kiss 360 Degrees trading cards from Press Pass also arrived this week. We sold out of this product well before its release, but we've picked up a small quantity of boxes from our secondary sources that we now have in stock. Like the Kiss Ikons set that Press Pass produced earlier this year, Kiss 360 is sold out at the manufacturer and in great demand. The set features Rock Star Relics (authentic memorabilia worn by the band), KISSIGNATURES (autographs from Gene, Paul, Ace, and Peter), a 6-card Transformation lenticular card set, a 12-card Snapshots acetate insert set, and a 90 card base set with 8 subsets. We are taking pre-orders for another non-sport set that looks like it may garner a lot of interest in the coming months. 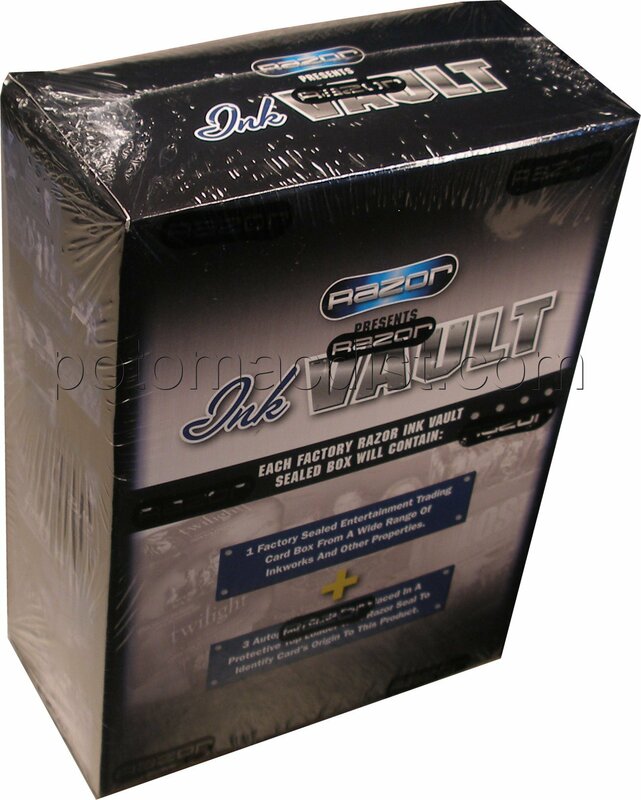 Razor Collectibles will be releasing 2009 Razor Ink Vault in September. Each box will include 3 autograph cards and 1 factory sealed entertainment trading card box from a wide range of Inkworks products and other properties. Included are Twilight, Buffy Series 1, Family Guy Season 1, Charmed Season 1, and many more. We haven't seen a product quite like this before. Boxes are just $45. Cases (20 boxes) are $869. There are a handful of new products arriving within the next week to ten days. Next week we expect to ship Yu-Gi-Oh Series 1 Collectible Tins and Pokemon Supreme Victors boosters and starters. The following week we expect to ship L5R Path of the Destroyer and Epic Time Wars. We are still taking pre-orders for all four products. We received several new products today. 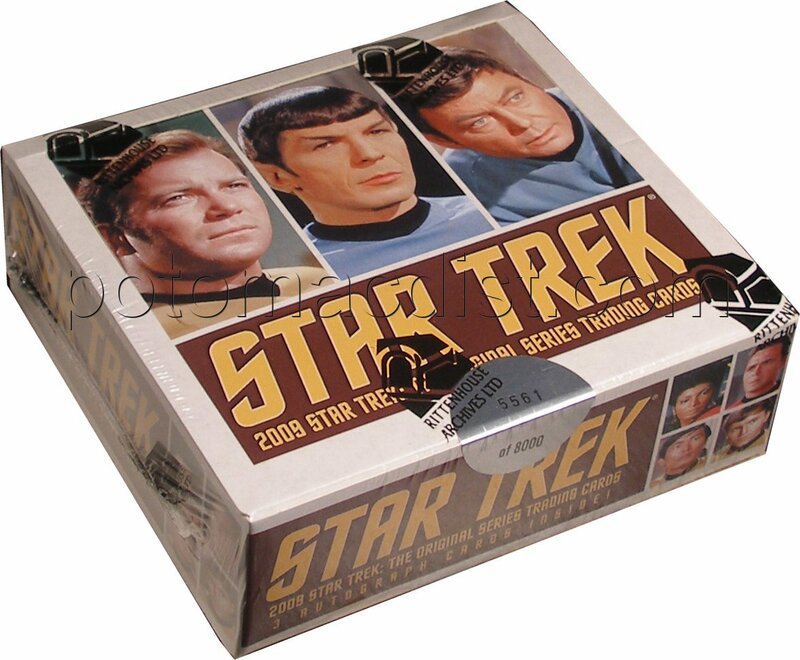 Rittenhouse's new 2009 Star Trek Original Series trading cards are in stock! Pre-orders have been shipped. We have a small stock of this product still available if you didn't get a chance to place a pre-order. We also have a few case cards, 3 and 6 case incentive cards, and an archive box avaiable! The archive box includes every pack-inserted insert card made for this set! The new Pokemon LVL.X Tins also arrived today. Each case includes 9 tins (3 Giratina tins from the '09 spring release, 3 Regigias tins from the '08 holiday release, and 3 Darkrai tins from the '08 spring release). We have just a few cases available. We added several new products to our list of gaming pre-sales today. Bandai's next Naruto expansion, Foretold Prophecy, is scheduled to release just before Thanksgiving. Although the release date is three months away, we are encouraging customers to pre-order Foretold Prophecy as early as possible. Bandai has been selling out of new Naruto products before they are released, and we would expect the same thing to happen with this set. We only require a 10% deposit for credit card pre-orders and a 25% deposit for all other pre-orders. Foretold Prophecy consists of 178 new cards. The set introduces two new mechanics - Mastery and Surge. Making appearances are new Ninja cards like Shion, childhood versions of the Third and Fourth Hokage, and new Uchiha clan members. Each pack contains 10 cards (1 holographic foil, 1 rainbow-stamped rare, 2 uncommons, and 6 commons). Super-Rare Gold-Holographic Foil cards are found 1:6 packs on average. Booster boxes are just $58. Booster cases (6 boxes) are $342. Theme deck boxes are $51. We've also begun taking pre-orders for Bandai's upcoming Naruto Unbound Power tins. Each tin will include 2 Fateful Reunion booster packs, 2 Emerging Alliance packs, and an Alternate Design Super Rare card from a previous set. There are three different tin designs - Naruto Uzumaki, Kakshi Hatake, and Sasuke Uchiha. You can purchase a sealed case (12 tins) for $134 or a set of all three tins for $39. 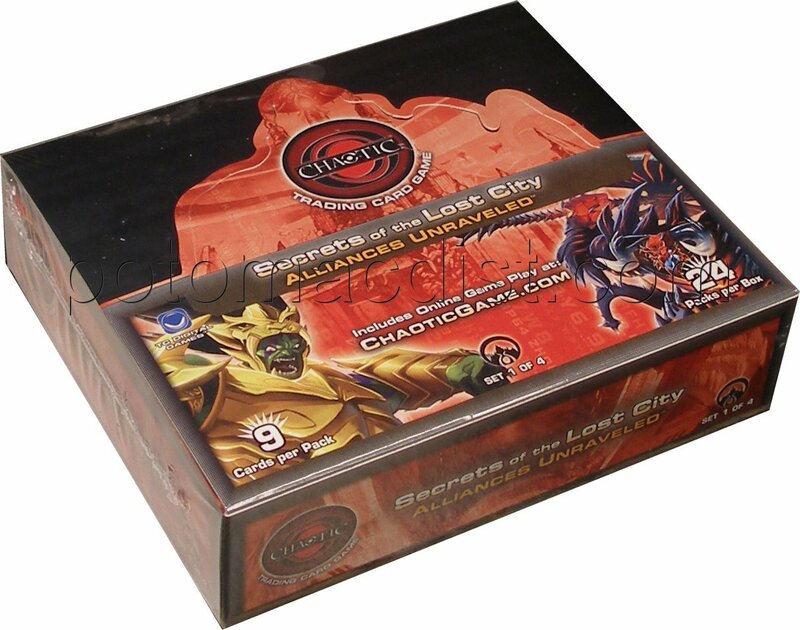 We are also taking pre-orders now for the next Chaotic expansion - Secrets of the Lost City. Every booster pack includes 3 rare foil cards. There are 226 new cards in the set. Booster boxes are available for $57, booster cases (12 boxes) for $672, and starter boxes for $74. Please note the unusual split release. Boosters are scheduled to ship by September 11th, while starters should ship by September 18th. A Game of Thrones and Call of Cthulhu card game fans may be interested to know that we have some of the new Fantasy Flight deck protectors on the way to us. We hope to have the new Spawn of Cthulhu and Jaime Lannister deck protectors in stock by the end of the week. 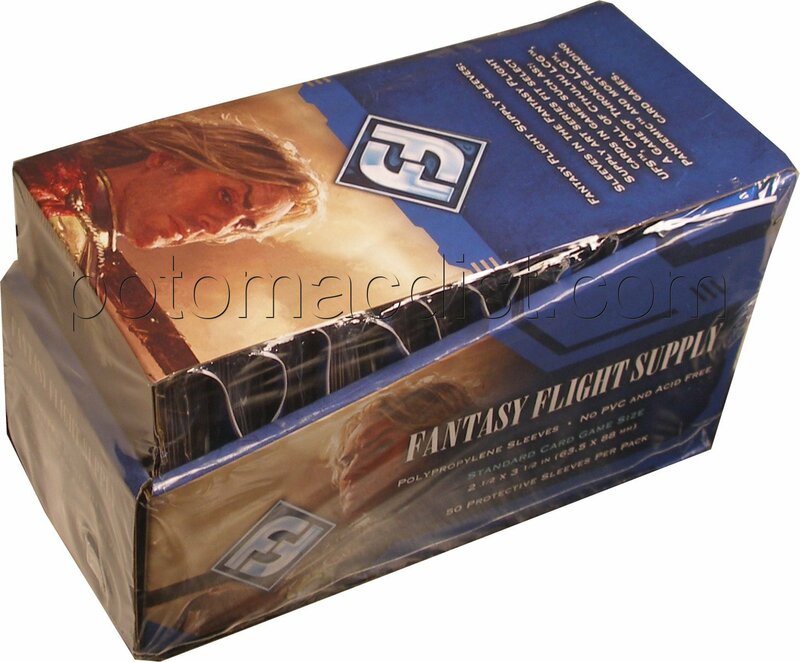 We also expect to have Fantasy Flight's new clear deck protectors in stock as well. Email us at sales@potomacdist.com if you are interested in any of these products or keep an eye on the news. We will post something here once they have arrived. WWE 2009 Trading Cards On Sale - Reminder: Pokemon Supreme Victors Price Increase Coming Soon! We are pre-selling WWE 2009 boxes for $39. Cases (8 boxes) are just $304. Don't forget that tomorrow is the last day to pre-order Pokemon Platinum Supreme Victors booster boxes and booster cases at our lowest prices! Supreme Victors is scheduled to ship by August 21st! The release of the new Pokemon Platinum expansion, Supreme Victors, is just around the corner. We expect to ship Supreme Victors pre-orders by August 21st. Next Tuesday, we plan to raise our booster box and booster case prices for this product, so place your order by then and save! We've had a number of customers asking us when we expect the new Warlord 4th Edition products to arrive. The 4th Edition Base, Shattered Empires, Crimson Coast, and Learn-To-Play sets were originally expected to ship by the end of July, but the U.S. distributor is still waiting for them to arrive. We don't have a specific release date at this point. The good news is that we are in regular contact with the U.S. distributor, and we should have Warlord 4th Edition in our warehouse within a day or two of the distributor receiving them. New Warhammer Invasion Card Game On Sale! Fantasy Flight Games has announced plans to add a new game to its Living Card Game stable. Warhammer Invasion is expected to debut in October. The Warhammer Invasion Core Set will include 220 cards representing 4 different factions, a rulebook, 35 resource tokens, 60 damage tokens, 4 burning tokens, and 4 player boards - everything needed for two players to play. We are pre-selling Core Sets for $29 each. The first Warhammer Invasion Battle Pack, Svavenblight Threat, will contain 40 cards (20 of which are unique). The battle pack includes cards for all 4 factions as well as neutral cards. We are pre-selling individual battle packs for $9 and 6-packs for $44. Yu-Gi-Oh Retro Pack 2 Boxes Have Arrived! The new Yu-Gi-Oh Retro Packs have arrived. Yu-Gi-Oh Retro Pack 2 boxes include 8 packs, each containing 3 booster packs and a Gorz The Emissary of Darkness secret rare card. Boxes are just $76 each.